The Irish may be the stout kings of thew world, but when it comes to beer the Germans know a thing or two about brewing. Specifically those clever folk in Bavaria. Luckily you don't need to go all the way to Bavaria to enjoy some of the finest German beers and foods. It's that time of the year again and Oktoberfest is upon us! 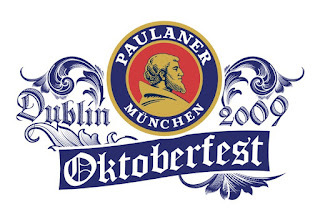 The annual Paulaner Oktoberfest kicks off next week on the 8th October and runs for a full 10 days until the 18th. This is the second year that the festival has travelled to Ireland is not to be missed. It's a free event, and is absolutely family friendly. You can experience traditional German fun, food and entertainment. Even better news, for those of us living in Ringsend, is that the Paulaner Oktoberfest will again be located in Dublin’s George's Dock. 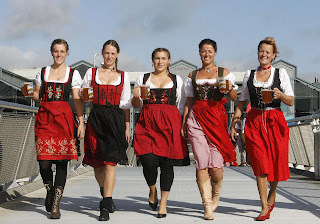 Perhaps even better news is that the festival will feature its famous marquee (representative of the Munich Oktoberfest), a host of German market stalls, and over 24 Munich barmaids, all aiming to share some German fun, food, entertainment and seriously tasty Bavarian beer. The Paulaner Oktoberfest will also offer visitors a taste of authentic Bavarian brass and dance music from the German group, Mostland Stürmer. The traditional German market will feature over thirty German speciality food traders, all of whom are travelling to Dublin specifically for the festival. So make sure to try the speciality sausages, meat, Käsealm and candy and ginger bread hearts. The festival will also offer visitors the chance to try Paulaner and Paulaner Non Alcoholic, as well as the special Oktoberfest brew. Last year over 70,000 people visited the festival and don't expect it to be any different this year. Whatever you do, don't miss this great opportunity. Alternatively, why not join the 190 festival fans already on Facebook?